Discover the potential health benefits of drinking meadowsweet tea. The meadowsweet plant is a tall shrub with green leaves and a white or pink blossom that is often mistaken for a wildflower. Meadowsweet is zone-hardy and is easy to grow in your own backyard. In fact, it may already be growing wild in the fields or your favorite park or nature preserve. Dried meadowsweet and meadowsweet extract have been used for health, wellness, and aromatherapy for hundreds of years. 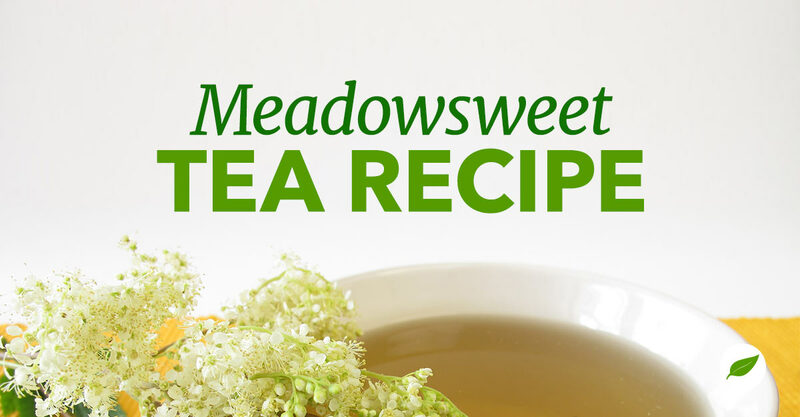 Keep reading to learn more about the potential benefits of drinking meadowsweet tea, along with 5 meadowsweet tea recipes to get you started. Meadowsweet tea and meadowsweet supplements have been used historically to break fevers, ease pain, and soothe digestive upset. Modern science has now concluded that meadowsweet contains phenolic compounds that may have antipyretic, analgesic, astringent, and anti-rheumatic properties to support a healthy internal response. In fact, researchers have concluded that “activity of meadowsweet extracts provide support of the traditional use of this plant in the treatment of different inflammatory conditions.” In addition to promoting a positive immune response, meadowsweet contains a small amount of salicylates, which may have a similar effect as that of aspirin. Just because you can’t get your hands on fresh meadowsweet, doesn’t mean you can’t experience the potential benefits it has to offer. The store at Natural Healthy Concepts is well stocked with meadowsweet extracts and supplements to get you started. For a simple meadowsweet capsule, check out Meadowsweet 250 mg from Solaray. Each dose provides the natural support of the meadowsweet herb, promotes a healthy immune response, and may leave you with healthier-looking, glowing skin. Support seasonal wellness and a healthy internal response in your kiddos with Kids Immune Avenger from Herb Pharm. Each alcohol-free drop contains meadowsweet, echinacea, elderberry, hyssop, ginger, horseradish, thyme, and cinnamon to give your kids the support they need to stay healthy and active. Inflamma Response from Herb Pharm is a blended liquid supplement formulated to support a healthy internal response. Using a unique combination of the meadowsweet herb, turmeric rhizome, chamomile, and licorice root each drop has the potential to bring both balance and immune support. How do you incorporate meadowsweet tea into your health routine? Tell us about it and leave your questions in the comments section below.